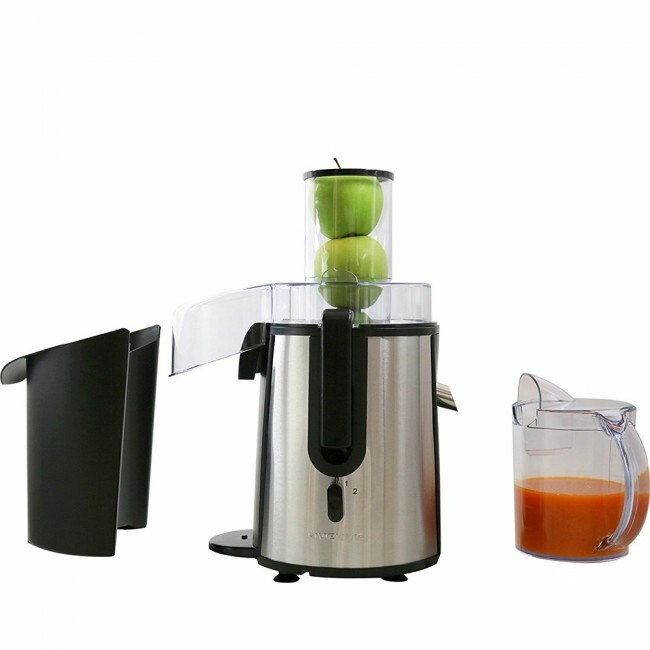 EASY, EFFORTLESS JUICING – Extra-wide 3-inch feeding chute can easily fit large, whole, or chopped fruits and vegetables inside it for juicing, saving you time and effort. 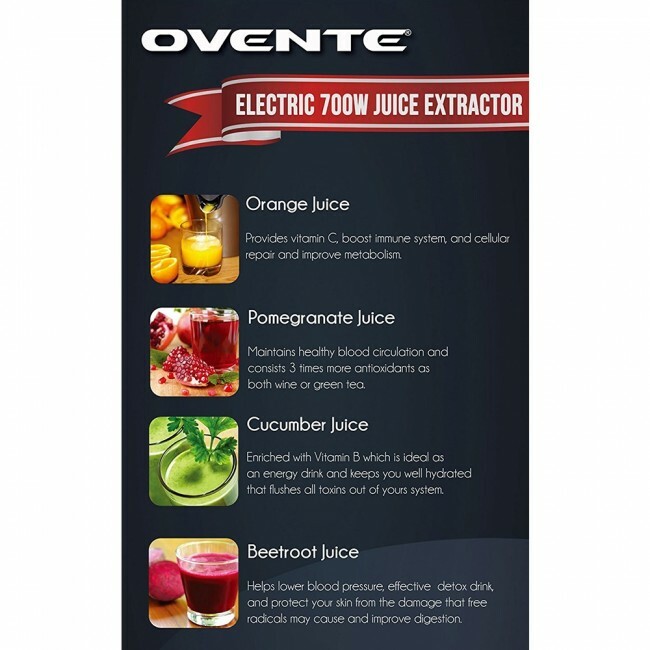 POWERFUL – Its 700-Watt motor is powerful enough to juice the hardest vegetables to the softest fruits. FAST & EFFICIENT – High-speed spinning through the stainless steel cutting disk/filter basket separates fresh juice from pulp for smooth, refreshing juice in seconds. EASY CLEAN-UP – The pulp bin makes cleaning a lot faster and easier. You can even repurpose the pulp into healthy treats such as salsas, preserves, or compotes, orsimply compost it. DISHWASHER-SAFE, GREAT VALUE – Most parts are dishwasher-safe, specifically the juice jug, filter basket, large pulp bin, and FREE bonus cleaning brush. Never have to drink processed juice with harmful additives, dyes, or added sugar—EVER AGAIN! 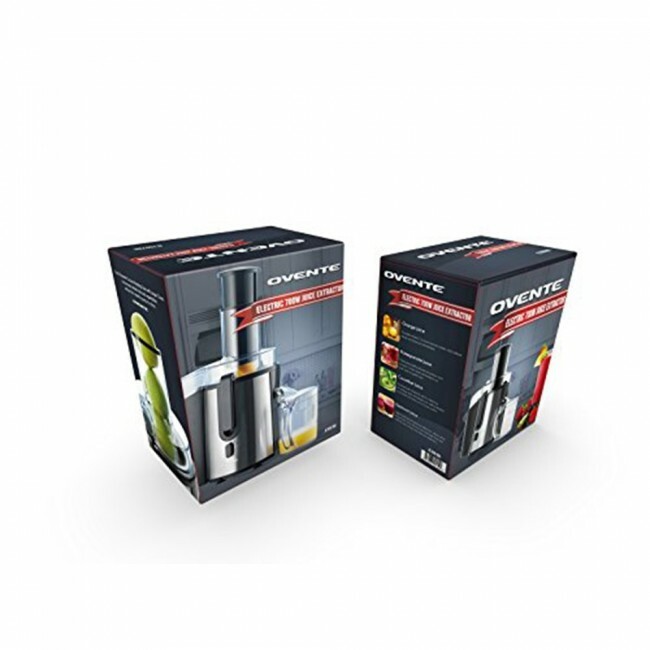 Live your healthiest lifestyle with your Ovente Wide-Mouth Juice Extractor in the comfort of your own home. 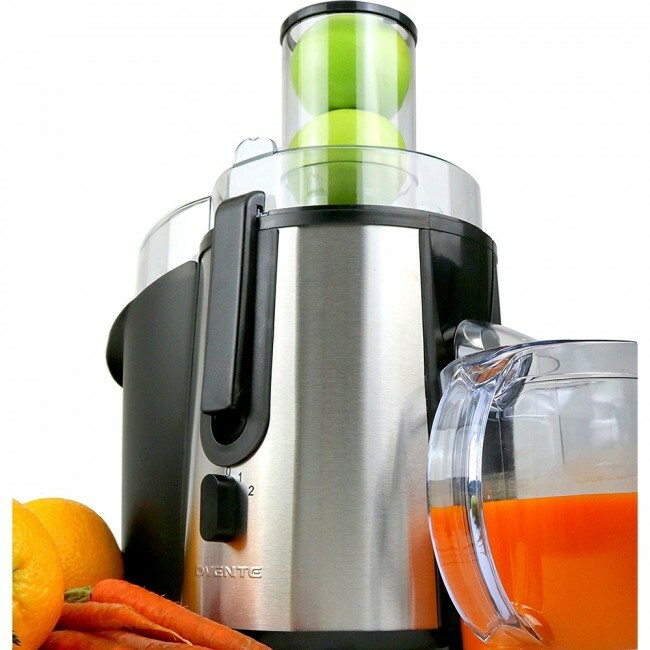 Powered by 700-Watts, this fast and efficient appliance allows you to juice any and all of your favorite fruits and vegetables with no sweat. 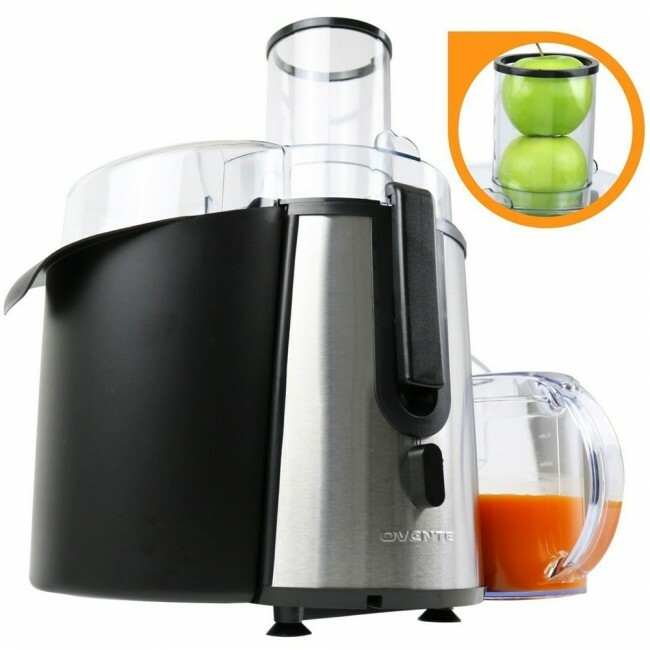 Simply throw your fruits or vegetables into the chute, and this juicer will do all the work for you. 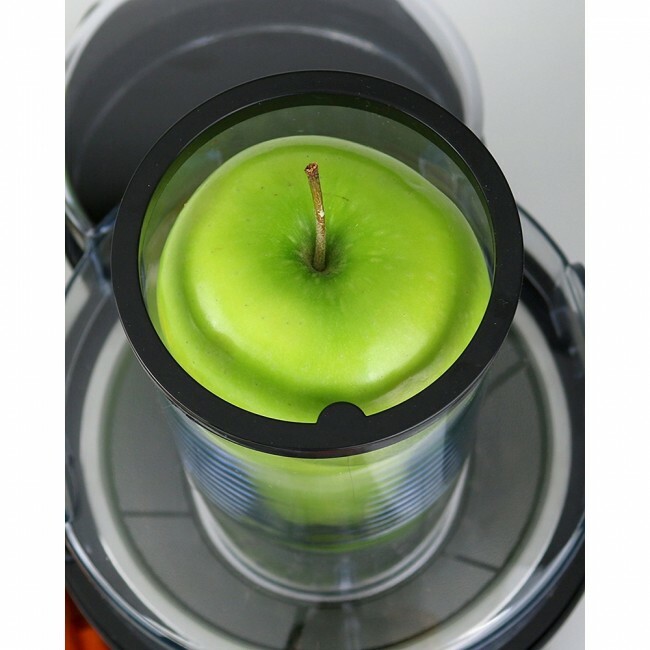 Not only does its chute have a wide mouth to accommodate all fruits and vegetables, it’s also convenient since you no longer need to chop anything into smaller pieces, saving you time on preparation. 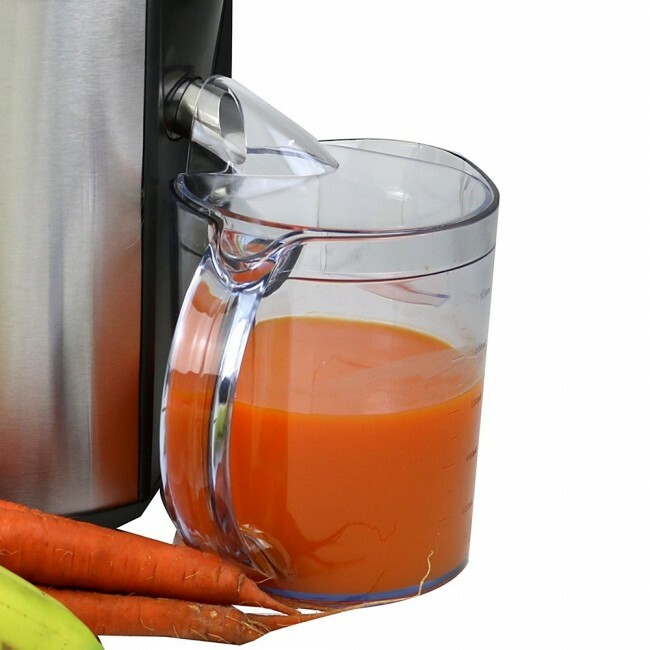 Throw whole apples and carrots in there and get fresh, healthy juice in seconds—it’s nearly effortless! Juicing helps you save money to become your healthiest self. Experts say that on average, your body needs 5-9 servings of fruits and vegetables per day to keep it working in tip-top shape. Most of us don’t usually consume this much per day, so it’s obvious there is room for improvement. If you can relate, then this juice extractor will become your new favorite daily appliance. Juicing helps you reach your daily goal of 5-9 servings of fruits and vegetables in a tasty, refreshing way, with almost no effort on your part! Healthy meals can often be very expensive, especially at restaurants. This juicer can help you save money while helping you reach your prime because all you need to do is buy fresh, organic produce. No complicated recipes or cooking skills are needed for you to reach your health and fitness goals—just some produce and this juicer. By staying healthy, detoxifying your system, and getting your daily dose of nutrients, you’ll gain clearer, brighter skin AND save yourself trips to the hospital while preventing yourself from cancers and life-threatening illnesses.